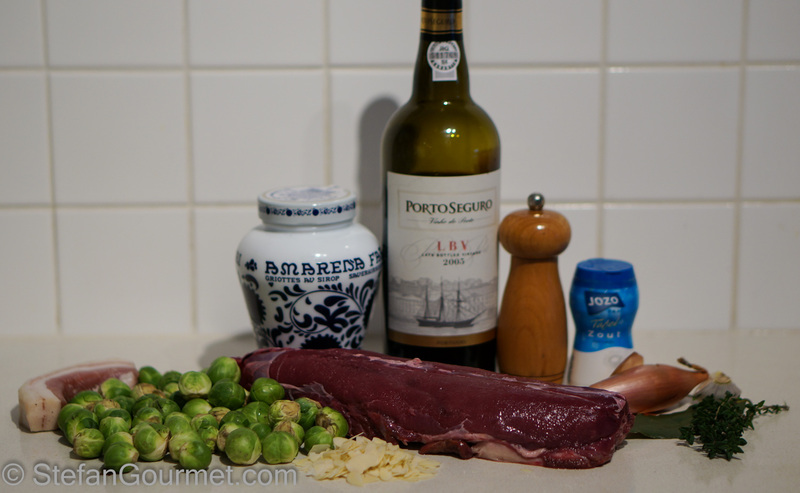 This was the secondo of our Christmas dinner — yes I am running behind a little in posting as I also still have to post the primo — loin of hare with a sauce of port and amarena cherries and brussel sprouts with pancetta. The combination worked very well. The sprouts were very nice as I used small ones, cooked them sous-vide, fried some pancetta and then tossed the sprouts in the pancetta fat and served it with the pancetta. Remove the loins from the bone with a sharp knife. Don’t forget the tenderloins ont he bottom. Reserve the carcass. 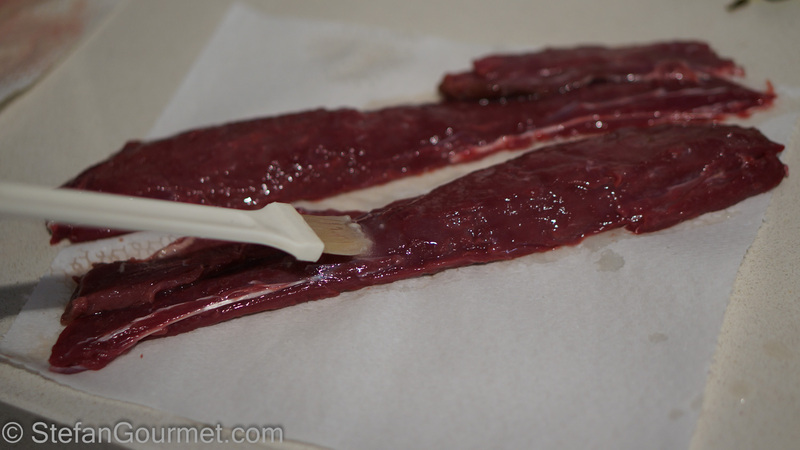 The loins are quite thin so it is easy to overcook them. Since I have a big bag of Activa (meat glue) to use up, I decided to glue the two loins together, head to tail so the thick part of one loin would be joined with the thin part of the other and vice versa. This is entirely optional, but it does make for a nicer shape. If using the Activa, vacuum seal and allow to bind for at least 6 hours in the refrigerator. 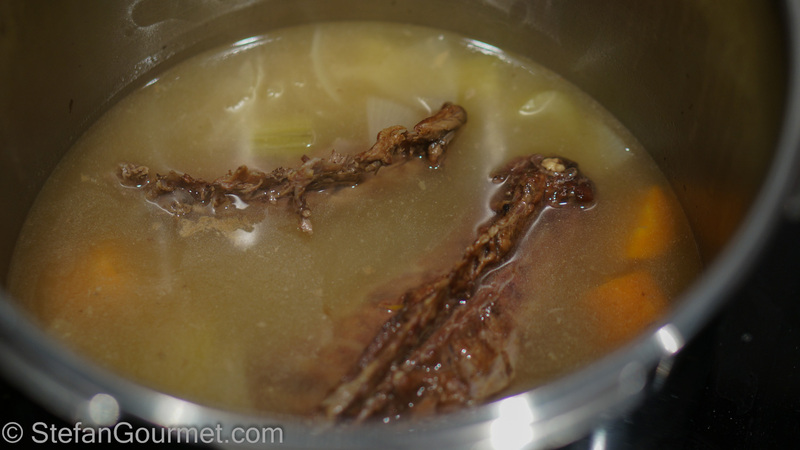 To make the hare stock, roast the carcass in the oven at 190ºC/375ºF for half an hour. 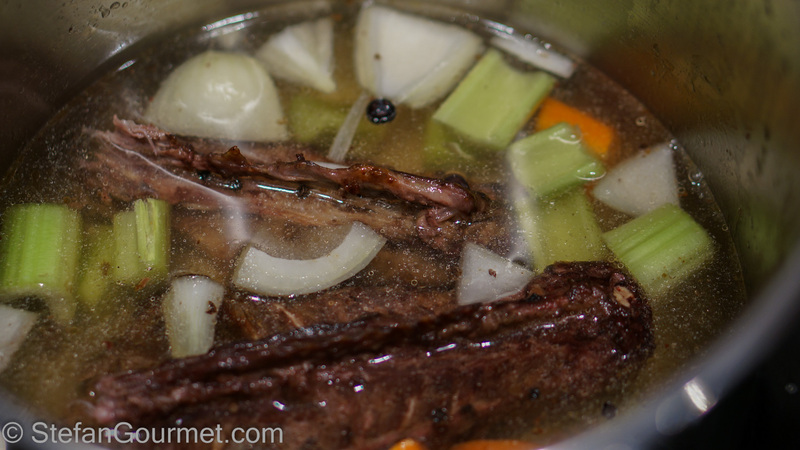 When it has finished roasting, put it in a stock pot or pressure cooker. Add the carrot, onion, celery, juniper berries and black peppercorns. Bring to a boil or bring to pressure. 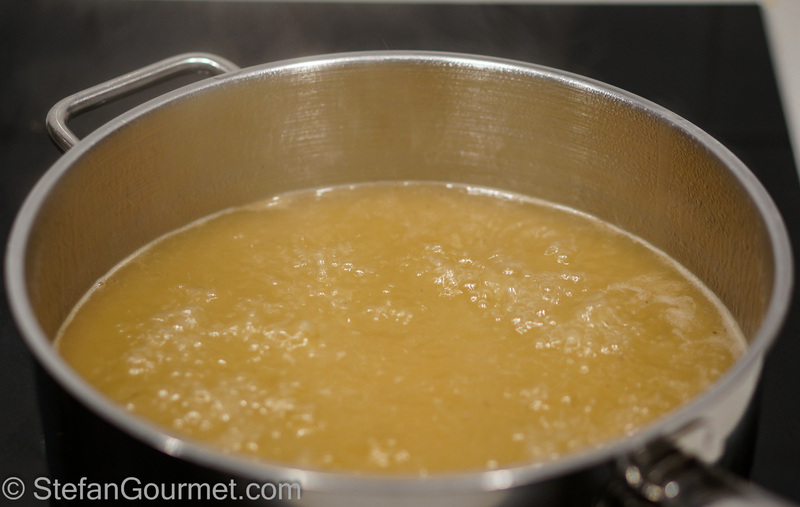 Pressure cook for 1.5 hours or allow to simmer in a stock pot for 3 hours. 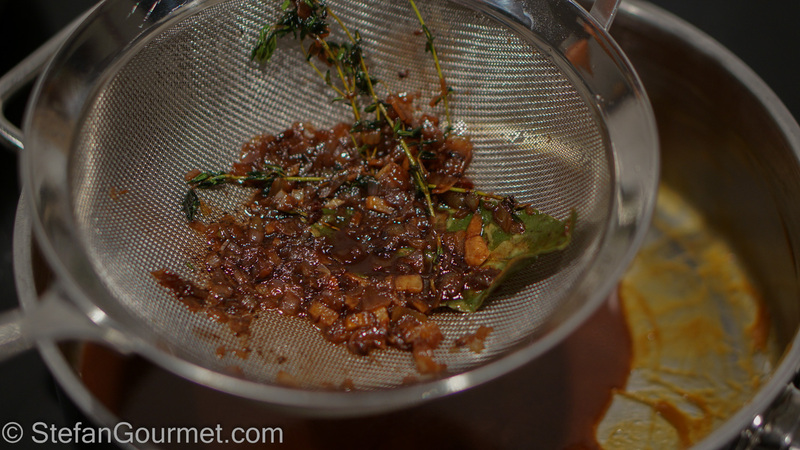 Then strain the stock with a fine sieve, discarding the solids. 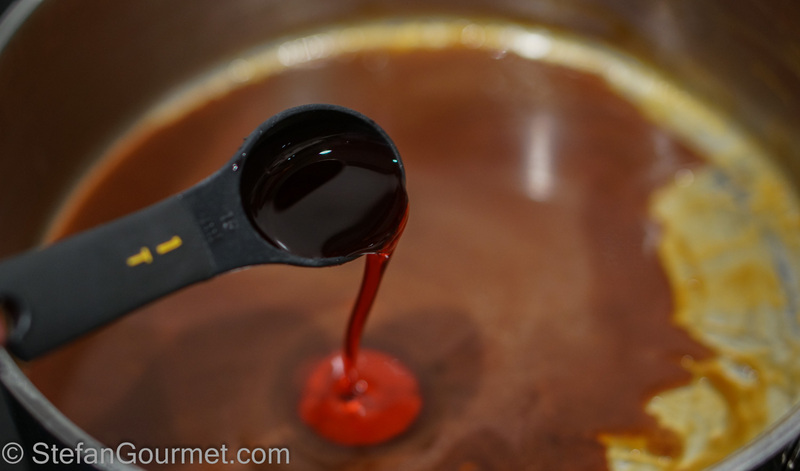 …and reduce it until only about 4 Tbsp are left. 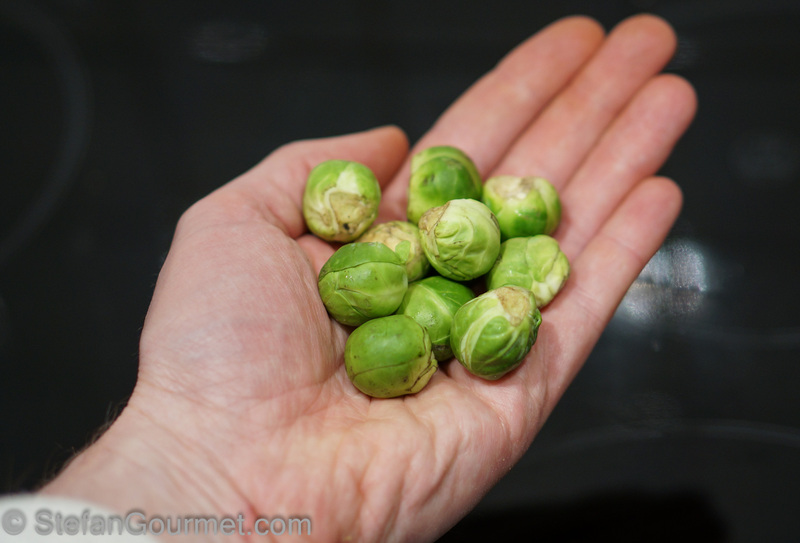 The easiest way to parcook them is sous-vide, which ensures that the sprouts will keep a bite and a nice flavor. 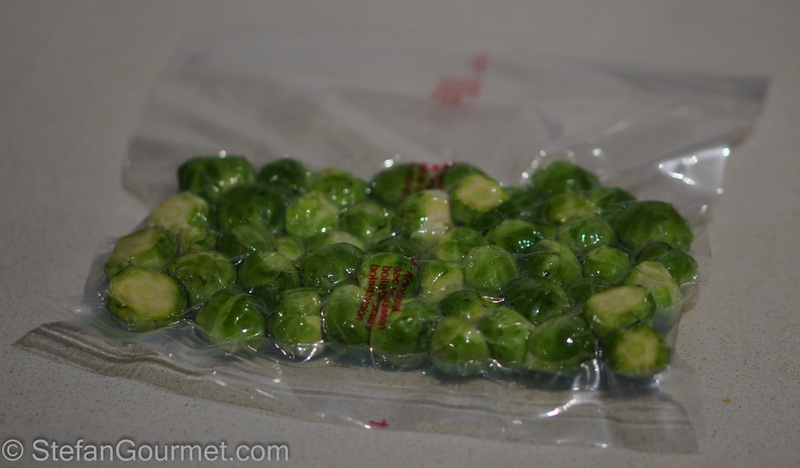 To that end, vacuum seal the brussels sprouts and cook them sous-vide for 30 minutes at 84ºC/183ºF. Otherwise, parboil them in water for about 10-15 minutes or until barely tender. 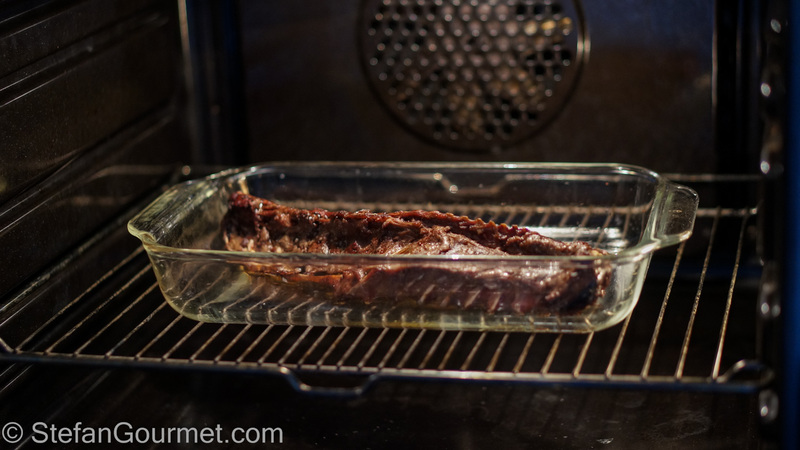 Preheat the oven to 100ºC/225ºF. 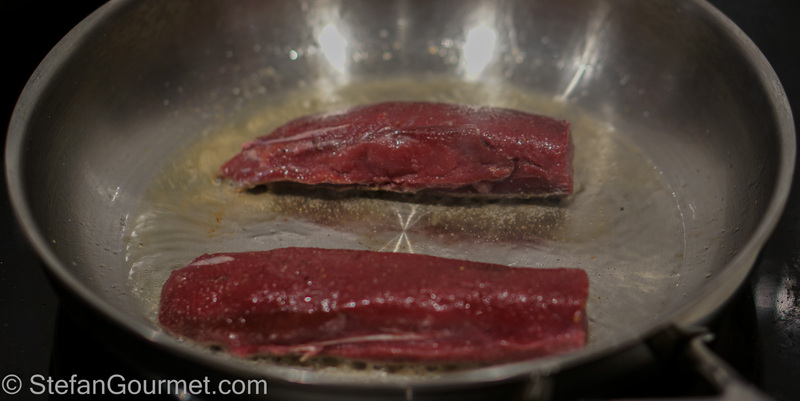 Season the hare loin with salt and freshly ground black pepper. 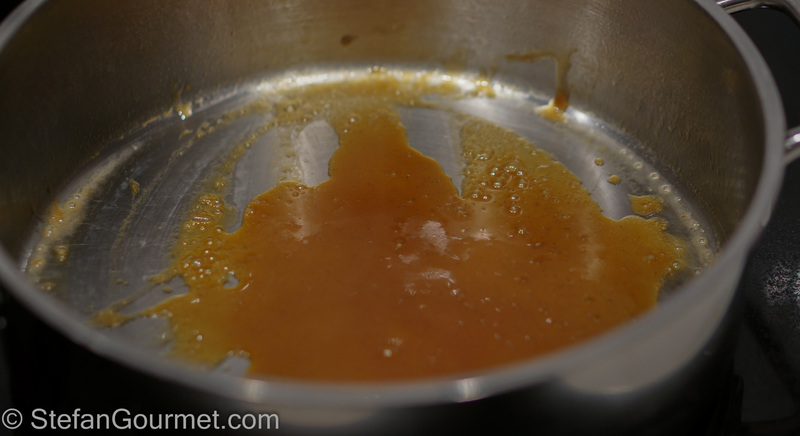 Melt the clarified butter in a frying pan. 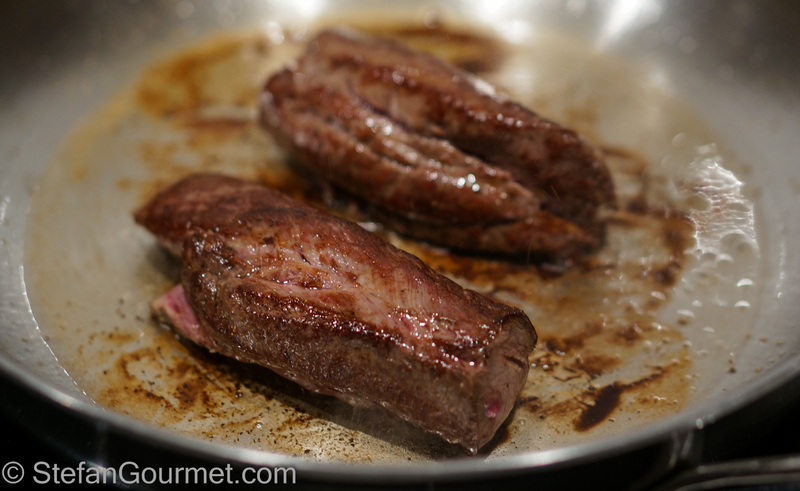 Brown the hare loins in the clarified butter over high heat. When the loins are nicely browned on all sides, insert the probe of a meat thermometer such that the tip of the probe is in the center, and cook in the oven until the core has reached a temperature of 55ºC/131ºF. Then wrap in aluminum foil to rest. 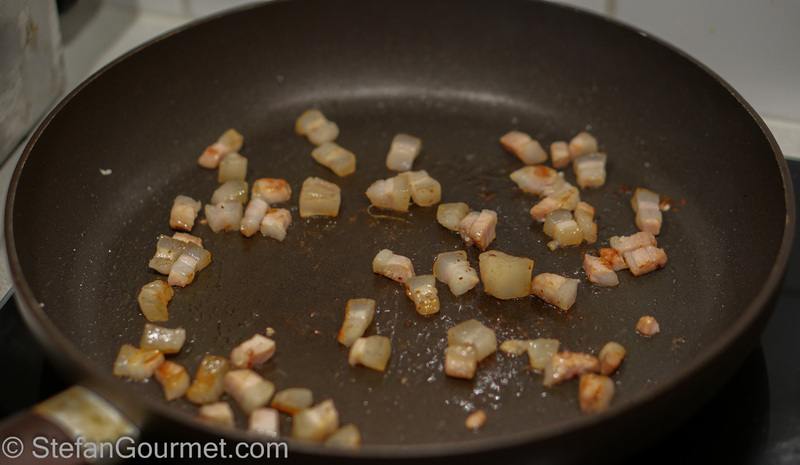 Meanwhile, fry the diced pancetta in a non-stick frying pan over medium heat without adding any fat. Stir now and then until the pancetta is starting to get golden and some fat has rendered from it. Then toss with the brussels sprouts. Taste and adjust the seasoning with salt and freshly ground black pepper. Keep warm over low heat. 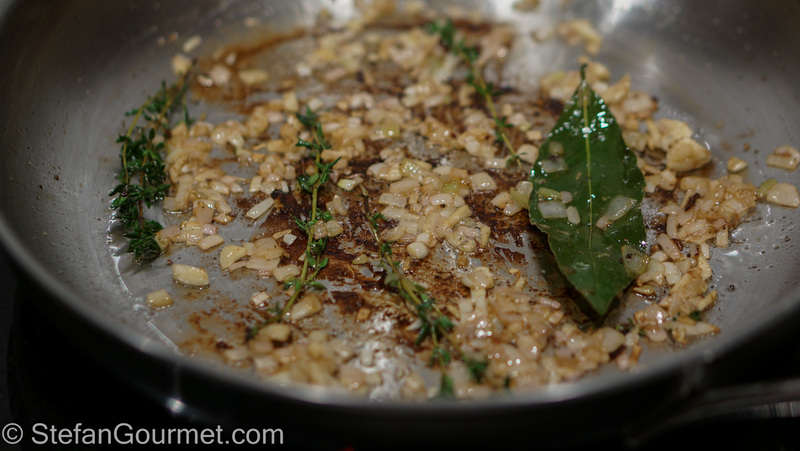 Add the shallots, garlic, bay leaf, and thyme to the pan in which you browned the hare. Cook over medium heat until the onion and garlic are golden but not brown. 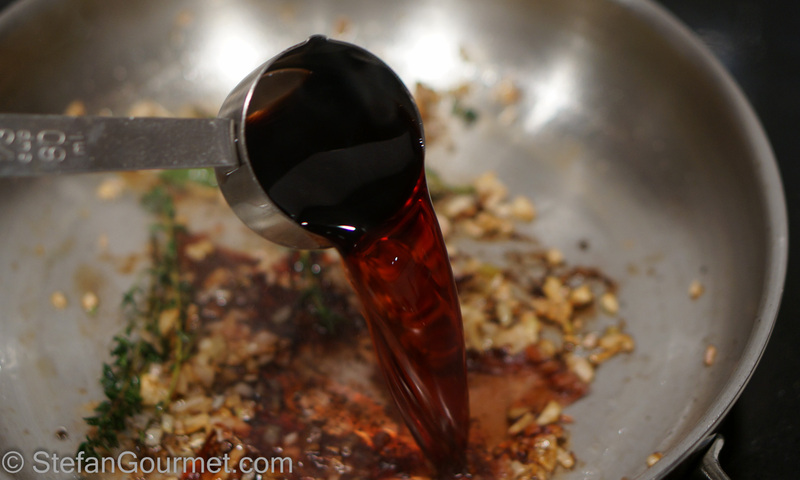 Deglaze with the port, scraping with a wooden spatula to include the browned bits into the sauce. 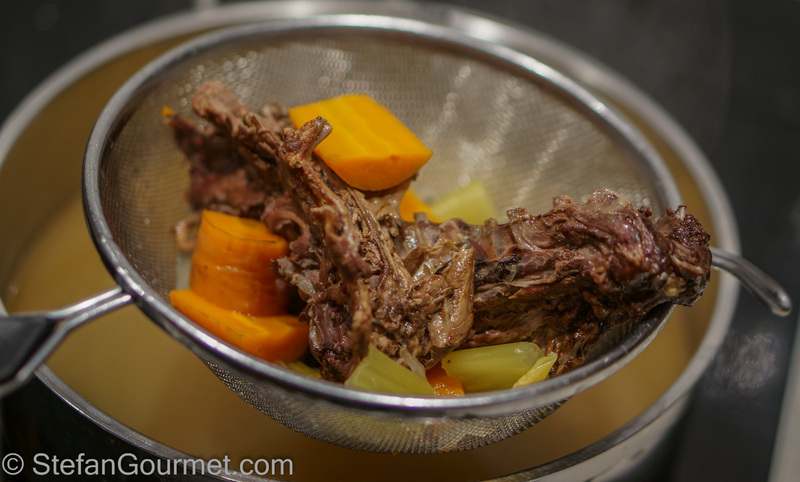 Strain the port into the pan with the reduced hare stock. 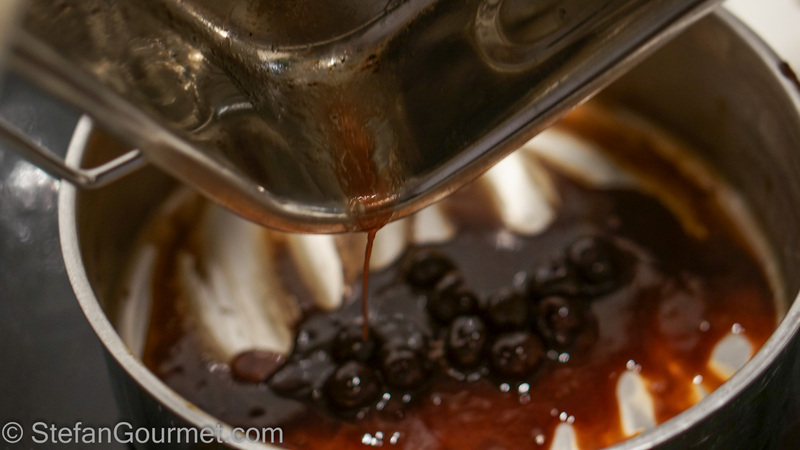 …the cherries and any juices that leaked from the hare while it was cooking in the oven. Cook over medium heat until the sauce is nice and thick. 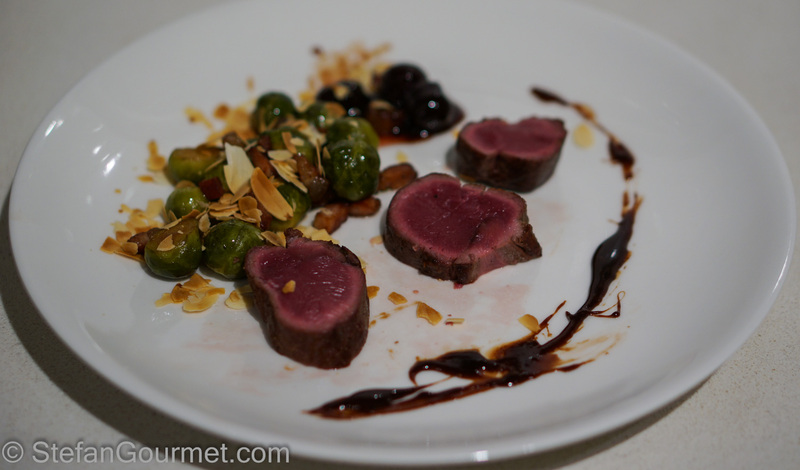 Slice the hare and serve it on preheated plates with the sprouts and the cherry sauce. 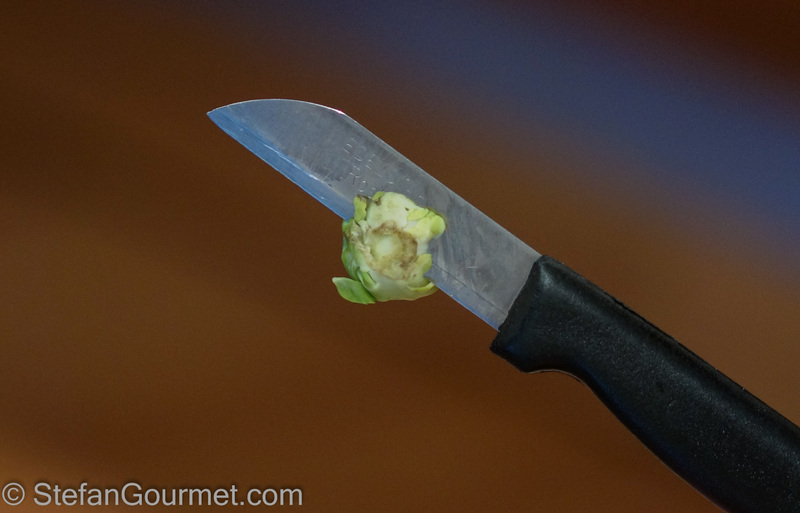 Garnish the sprouts with the slivered almonds. Season the hare with a bit of additional salt and pepper. Serve at once. This is great with a full bodied red that can handle the flavor of the hare, cherries, and sprouts, such as an Amarone. These pumpkin gnocchi are similar to the gnudi I posted about recently, in fact they could also be called pumpkin gnudi. Raffinatissimo, anche i cavoletti sono chic! Thanks for the suggestion. I’ve never seen smoked ricotta here (only smoked mozzarella), but I suppose I could smoke it myself 🙂 Is that based on ricotta salata or ricotta fresca? I am pretty sure tha base is ricotta salata, it is not very traditional (common in industrial ricotta) but i think the addiction of some cream (10/15% of the milk) would make the final product tastier. Great dish and gorgeous presentation, Stefan! Great stuff. 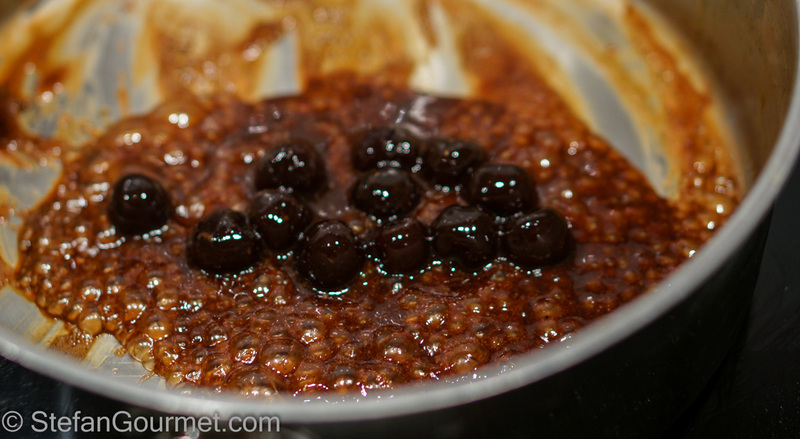 I have some of the cherries left since Christmas and must try to use them in such a sauce. The glueing is getting out of hand! I would love to try it. Please do. You will have me arrested at this rate! It keeps best in the fridge, but with this weather it should reach you in working condition. Looking forward to what you’ll do with it. I haven’t actually done anything weird with it yet, like gluing fish and meat together or something. The mind boggles. I will have to give it some thought. Fabulous!!! The only rabbit (not hare) we find in the DFW area is farmed and they are on the small side. I have larger wild ones in my backyard. 😮 I keep trying to find someone who has hare but so far I haven’t been lucky. Given your into gluing, you might want to check out Thomas Keller’s Rabbit and Bacon Presse. 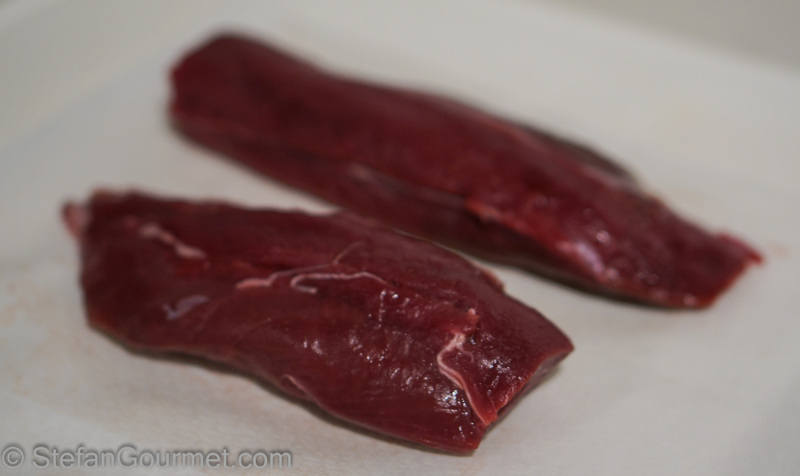 It’s why I have been wanting to find a hare supplier – 30 pieces of rabbit flank is 15 rabbits!!! It looks and sounds divine. I have had the Activa (along with a few other toys) for awhile but have yet to play with it. A lot of the hare here is imported from Argentina (although I prefer the local stuff), perhaps you can get that in the US too? Hare is not native to the US, but according to Wikipedia there are a few places where hare has been introduced to be hunted. I love rabbit flank. but I do not agree at all with Thomas Keller’s recipe to cook it for 12 hours at 74C/165F! The flap meat was very tender and juicy after cooking it sous-vide for 3 to 4 hours at 60C/140F. There are more strange times/temps in that book. I would love a source for just the flanks, as the only way to get them is to buy whole rabbits. And even those are often only available frozen.